SH: A lot of poets talk about how poetry is at least a dying art — something no one ever reads any more. How is that not true in Mormon culture? What is poetry’s place in contemporary Mormonism? TC: Poetry isn't dying. And any poet who suggests otherwise may not be worth her/his salt as a poet. I'm just sayin'. I, for one, believe poetry is as vital and virile as it ever has been, if not more so. Consider the following varieties of contemporary American poetry — though it might be more productive to think of "poetry" in the plural. So: Consider the following short list of contemporary American poetries: ASL, concrete, cowboy, free verse, formal, hip hop, jazz, language, lyric, prose, slam, sound, spoken word, rap, video, visual. And many of these poetries contain further variations on and combinations of each theme. What's more, there's really something there for everyone. If you don't like formal or lyric verse, try some spoken word or slam. If slam's not your cup of tea, try some concrete or visual poetry. And so on and so forth. The reading possibilities are there and anyone with access to the Internet can track down examples of excellence in each category with a simple keyword search (though Googler beware: this will also bring up some not-so-excellent examples). So, again: poetry isn't dying. It's very much alive and thriving. And you can even have it delivered straight to your RSS reader every day. As for poetry's place in contemporary Mormon culture, I think Latter-day Saints — as with many in broader American culture — may in general read a) more classic than contemporary poetry (cross reference Best-Loved Poems of the LDS People, which contains work “from Shakespeare, Dickinson, Longfellow, Wordsworth, and Kipling, [. . .] alongside classic LDS poets W.W. Phelps, Eliza R. Snow and David O. McKay”) and b) more didactic or sentimental or sensational verse than work by contemporary poets. By this I mean that many of us may prefer poems that offer an easy moral or emotional or spiritual payload, one that could be grasped with a cursory reading of the text and used to illustrate a gospel principle in a sacrament meeting talk, which, let's face it, may be one of the only times some of us go looking for or are exposed to poetry in the first place (cross reference Especially for Mormons, where, “[f]or almost 30 years, thousands of Saints have turned [. . .] to find inspiring stories, quotes, and thoughts to use in lessons and talks”). But such poems are often really just doctrine or morals masquerading in predictable rhythms and rhymes. And while I'm happy poetry has any place in contemporary Mormonism, "all is not [yet] well in Zion" — but we're getting there. The quoted part of that statement is an echo of Clinton F. Larson, who is often referred to as the first modern Mormon poet (think Parley P. Pratt meets Dylan Thomas). Larson borrowed the line from Nephi over four decades ago when he was asked in an interview with Ed Geary to consider "the future of poetry in the church." I find the rest of his response especially relevant today when so many Mormon poets have made their way into mainstream American poetry and are being published by respectable journals and presses and being nominated for and winning national prizes and endowments for their work. Anyway, Larson suggests in his reply to Geary that “[p]art of the spiritual record that must be kept [by the Latter-day Saints] is the poetry of the people.” He then warns that without a “body of significant and enduring poetry” to connect the Saints sensually and aesthetically to their religious experiences, Mormonism's cultural heritage would be in jeopardy. He actually says it would “not, in fact, exist.” Poetry, then, as Pulitzer Prize winning poet Robert Hass observes, is “a sign of cultural health.” It’s an indication, Hass continues, that “a lot of people [in the culture are] literate and alive,” simply because “[y]ou have to have some kind of interior life to make [and to enjoy] a work of art and in a world as busy and heedless as this one we need all the consciousness we can muster” in order not to wither on the vine, as it were. So poetry comes of introspection and carries with it an abiding awareness that the inner life matters. And this strikes me as being especially relevant to Mormons in terms of the LDS quest to marry our inner- and outer-lives, to expand our personal and cultural consciences and consciousness toward the establishment of Zion. But I’ve gone too philosophical now, haven’t I? 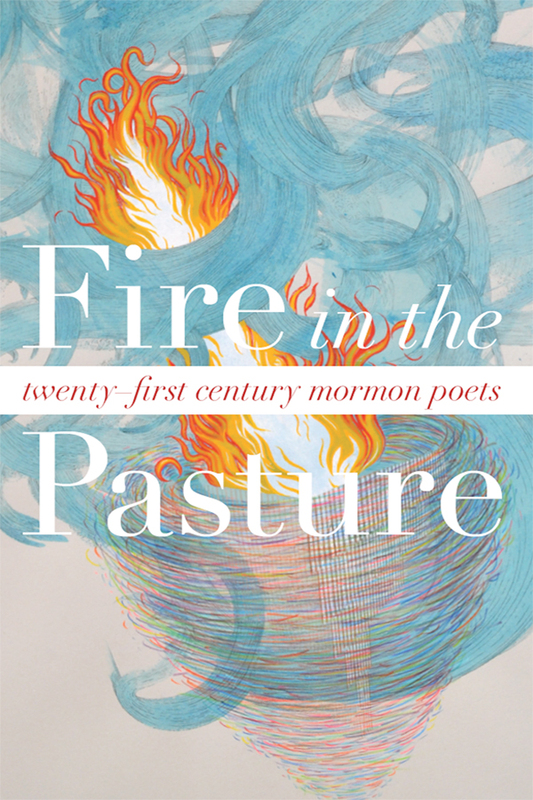 SH: How does Fire in the Pasture take Mormon literature — and specifically Mormon poetry — in a new direction? 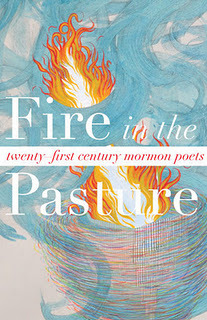 Rather than being a compilation of “Contemporary Mormon Poems,” with the implication that each of the poems contained therein will somehow reveal its inherent “Mormon-ness” to a discerning reader, Fire shifts attention to “Twenty-first Century Mormon Poets”—the difference being that this collection concentrates on the poetry (and thereby the poetics) of poets who are Mormons. On poets. As I see it, then (and others are, of course, free to disagree), Fire in part turns attention to the cultural work these poets and their poems perform. This work includes, among other things, theories of life, religion, and spirituality; cultural critique, of Mormonism and beyond; and explorations of doctrinal, historical, personal, and sociological territory that may not be fully possible in the functional — and sometimes completely bureaucratic — prose of historical and contemporary Mormonism. SH: So, here's the most important question: Why should every Modern Mormon Man have a copy of Fire in the Pasture on his bookshelf? TC: Because it matters. And poetry in general matters. And he should really keep it on his nightstand, not on his bookshelf. I mean, look at the cover: it’s gorgeous — and sensual, as poetry is also sensual. Who couldn’t use more of that in their bedrooms lives? Tyler Chadwick lives in Pocatello, Idaho, with his wife, Jess, and their four strong-willed daughters. He’s (almost) a doctoral candidate in English at Idaho State University--just needs to get those blasted comprehensive exams out of the way!--and he teaches freshman composition at ISU and online for BYU-Idaho. He sometimes blogs at chasing the long white cloud and A Motley Vision and he's recently started writing on poets, poetries, and poetics at tawhiao.tumblr.com. His latest poetry project is an ekphrastic (*bless you*) engagement of J. Kirk Richards’ paintings.